When my plane lifted off the field at Kansas City, after sitting on the tarmac for nearly an hour, I knew, already, that I would miss my connection to San Diego, the last one for the day. I was going to have to spend the night in Minneapolis. But, thanks to inflight wifi, and a chance, online meeting with my friend Superman (a.k.a., Pipsqueak, who, despite the rumors, grew up in Minneapolis, and not on a farm in Kansas, after he was rocketed to Earth from Krypton), by the time I landed, I had a dinner date lined up (with Mama Superman) and a place to stay (the Superman homestead). While The Bachelor Farmer topped my Minneapolis list, it topped many others’ as well, including Bon Appetit Magazine’s, which happened to name it one of the ten Best New Restaurants of 2012 that very day. So, not surprisingly, the restaurant was fully booked (with a line out the door) when I called. We went to Stewart Woodman’s restaurant, Heidi’s, instead, and had a lovely meal in its funky dining room, a mix-match of graffiti-style and installation art. The nine-course tasting menu was divided between classic, Continental cuisine, like an amazingly tender piece of beef tenderloin – smoked, and sauced with foie gras beurre rouge – and decidedly Asian dishes, like pickled beef tongue, with soy sauce and shiitakes, and fried sweetbreads, glazed with an Asian barbecue sauce and served atop gingered rice. At the end, there was a fantastic sweet cream ice cream, full of fresh strawberries, “churned,” table-side, with liquid nitrogen, and topped with pistachio praline. There are few things more entertaining than having your friend’s childhood narrated to you by his mother. So, after dinner, Mama Superman walked me back in time through the family album, showing me photos of Superman at age three, with cowboy boots on the wrong feet (that’s how he preferred to wear them, she said), and Superman in his little league hockey uniform, and Superman’s first showing in culinary school. Altogether, it was a wonderful way to spend an unscheduled, stormy, overnight layover in the Twin Cities. Thanks, Mama Superman! When my friend Villa Vixen called me earlier this year to ask for advice on organizing a fundraising dinner (she’s on the board of Words Alive, a nonprofit, early literacy program in San Diego), it seemed pretty clear to me what she should do: call Christopher Kostow, who’s mother also serves on the board of Words Alive, and ask him to cook a dinner in La Jolla with his mentor Trey Foshee at Foshee’s restaurant, George’s at the Cove, where Kostow used to cook. And, that’s exactly what she did. To thank me for dropping that tiny bit of advice, which I was happy to do, Villa Vixen invited me, along with our friends Chuck Eats and Adam of A Life Worth Eating, to be her guests at the dinner. I decided to make a weeklong trip of it, and explore the region while I was out there. Landing in sunny San Diego just a little before noon, I was picked up and taken straight across the border to Tijuana, Mexico by Trey Foshee and his wife, the lovely Madame X. We spent the afternoon crawling from one taco stand to the next, focusing on fish tacos, a specialty of Baja California (the ones here are always battered and fried, never grilled), and assorted mariscos (seafood), like a soy saucy octopus ceviche at Mariscos Ruben, and delicious, smoked marlin tacos at Mariscos Becerra on the beach (what a wonderful way to use an otherwise undesirable fish). Sadly, I find most tacos al pastor dry, filled with shaved jerky and unripe pineapple. But the pork on the spit at Taqueria “el Franc,” near Tijuana’s Cultural Center, looked particularly juicy, sizzling with fat as it turned. So, we sat down and ordered a couple. Here, they dredged the tortillas through a trough of drippings and let them fry, lightly, on the griddle, before filling them with the meat, onions, cilantro, and a dollop of guacamole. These were far from the most attractive tacos al pastor I’ve seen, but they certainly were among the most delicious. We ended the night at Misión 19, Javier Plascencia’s modern, fine dining restaurant, the only one of its kind and caliber in Tijuana. There, we were served local, artisanal Mexican cheeses, and – of all things – foie gras, something which you can no longer get across the border in California. I returned to Mexico a couple of days later with my friends Adam and Mala Mexicana, who were in Ensenada for the annual Fiesta de la Vendemia – Mexico’s grape harvest festival. They drove up the coast to pick me up for a trip back down the Baja. From San Diego, we followed the breathtaking Pacific coastline south, making a day-long buffet out of the beach. After a pit stop in Tijuana for tortas at Tortas Washmobile, a food truck named after the carwash across the street, we paused in Porto Popotla, a seaside fishing village of shuckers and pelicans. I’ve never seen anything like it, an entire beach devoted to eating, crowded with fishmonger stands, food stalls, and pitched umbrellas. From Mariscos “los Compadres,” we ordered ostiones huaraches – “sandal oysters,” so named because they’re about a foot long – and amazing ceviche of abalone, sea urchin, sea snails, and chocolate clams, all of which we ate with the foamy surf washing up not ten yards from our table. 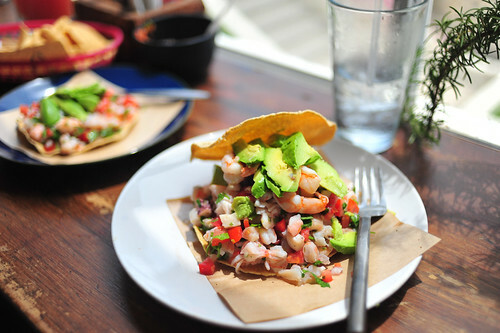 In Ensenada, we hopped from one food truck to another. 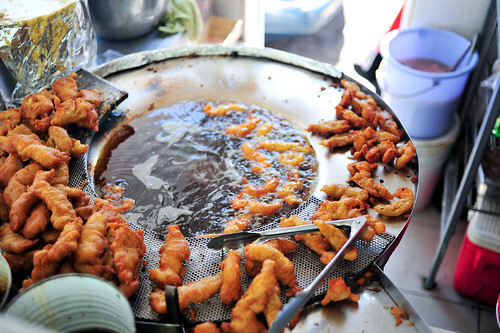 At Tacos Fenix, I was mesmerized by a team of battered fish and shrimp swimming in a pool of shimmering oil. Hot and crispy out of the fryer, they were served on tortillas with a counter of condiments at the ready – shredded cabbage, salsas, lime, and crema. Adam and I laughed at how much we two gringos piled on our fish tacos compared with the locals, who seemed spare, and smart in their approach. Ours overflowed and fell apart. We knew they would. But they were delicious anyway. At Mariscos “el Gordito,” they shucked meaty Pismo clams to order over a tub and then poured the collected juice into cups, filled with clam meat, salsa, and lime (I have never seen so much juice come out of one lime), a seafood “cocktel.” A dozen of us huddle under the truck’s eaves, out of the hot sun, drinking our seafood and reaching for tortilla chips out of a communal bag sitting out for all to share. It was great. We caught up with Enrique Olvera, chef of Pujol, at Mariscos “la Guerrerense,” for tostadas (some smothered with sea urchins, others with creamy fish salad), and then rocked out my favorite fish tacos of the week to Alejandra Guzman, who was blasting on the speakers at Los Originales Tacos de Pescado de Ensenada. Afterwards, we cooled off with cold cups of horchata de cebada, a sweet, caramel-colored horchata made of barley instead of rice. 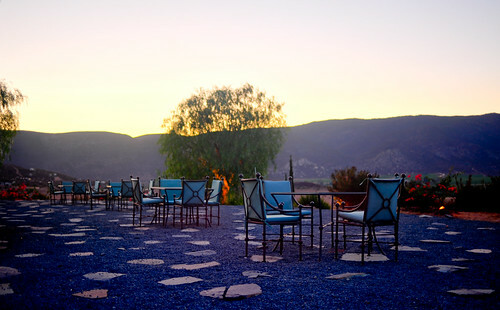 The month-long Fiesta de la Vendimia was at its peak when Adam and I arrived in the Valle de Guadalupe, a valley that constitutes Mexico’s wine region. It’s amazingly similar to Napa – a long, narrow trench between mountains, with two highways on either side and vineyards in between. Enrique Olvera was cooking a special dinner at Villa del Valle, a boutique hotel situated on a stunning property in the valley. We toured the grounds, and met Diego Hernandez, chef of the resort’s restaurant Corazón de Tierra, a beautiful, open-air box looking out onto an organic garden. I wished we had time to stay for dinner. Instead, we scurried back down to the coast, where Paco Méndez, the opening chef of Albert Adrià’s upcoming Mexican restaurant in Barcelona, Jaguar, was cooking a special dinner at Benito Molina’s Manzanilla. I hope his food at Jaguar will be much more compelling and coherent than what we had that night. Back in California, my time was split between family and friends. Villa Vixen outdid herself as a hostess. In anticipation of our arrival, she stocked her kitchen with ice cream and Pappy Van Winkle bourbon, which, together, made an excellent midnight snack, one poured over the other. It was hard to justify going out at all. 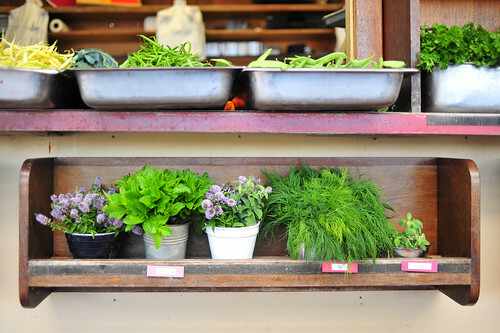 I spent a couple of mornings with Foshee, first at the beach for a crisp, morning swim, and then at the Chino farm stand, where I watched him pick through a rainbow of produce, all of it pristine and ripe. I returned to Cardiff-by-the-Sea a few days later to meet Foshee for blueberry buttermilk donuts at VG Bakery. It was old-school. I loved it. In La Jolla, I organized a mini cousins reunion at Herringbone, former Top Cheftestant Brian Malarkey’s latest addition to his collection of “fabric” restaurants. Never mind the food, which was probably better than it needed to be – our salad and sandwiches more so than the pizzas – the interior of this place was gorgeous, a spacious, sky-lit grove of 100 year-old olive trees. The bar too, tiled in colorful mosaic, was beautiful. At night, it might be a scene, but for lunch, it was absolutely lovely. Down the street from Herringbone, I had dinner with Adam and Mala Mexicana at George’s at the Cove, just the three of us and a view of La Jolla beach. Foshee offered to cook for us. With all of the eating we were doing, we asked him to go easy. So, he sent out eight lovely little courses, focusing on produce of the season, including a colorful salad of beets and figs with feta vinaigrette, and a refreshing beef tongue salad, served cold with pickled vegetables. 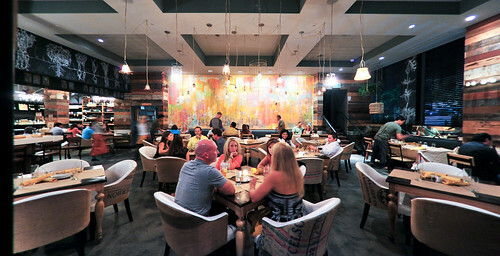 In San Diego, Villa Vixen and I went to Cucina Urbana for modish Italian food in a modish space. I particularly loved the watermelon panzanella, served with milky, housemade ricotta, and a length of roasted suckling pork sided by a poached egg and a spoonful of sherry-mustard sugo. Those were delicious. Our pastas, on the other hand, were disappointing. Both were a tad tough, especially the crimped edges of the otherwise delicious sweet corn agnolotti. But quality is hard to maintain when you’ve got such a large menu, and turn such high volume, isn’t it? The place was slammin’ from the time we sat – around 7:30 – to the time we left, nearly three hours later. And it wasn’t even the weekend. But, service certainly did not suffer. Our server was efficient and helpful, and at least two managers dropped by our table throughout the night to check our progress. I hadn’t seen my friend Andy in a couple of years. So, we met for lunch at Urban Solace, where we had wonderful cheese biscuits, served warm, and a hearty B.L.T. sandwiched between thick toast that sopped up the runny yolk from the fried egg inside. It was a simple, but solid meal. On Convoy Street, San Diego’s Asian avenue, I met Foshee for Szechuan food at Spicy City. It wasn’t bad. But I’ve had much better. Everything was spicy and flavorful, but all of it was the same shade of spicy and flavorful. Szechuan cuisine can have much more dimension than this. Just a block away, I met Yao and his wife for yakitori at Yakitori Yakyudori. The grilled beef tongue was particularly good here. And, of course, there was the Words Alive dinner at George’s at the Cove, which was not only a fundraising success, but a fun night with great friends and food. 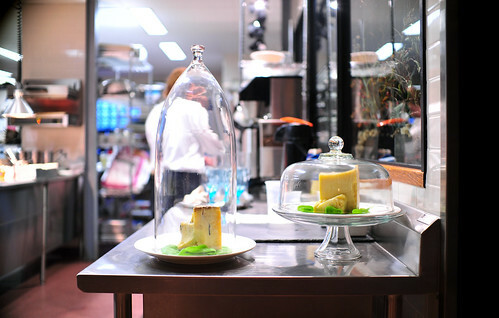 From Foshee came a canapé of ginger-cured Chino tomatoes with burrata, and a silky filet of wild king salmon, mi cuit, with truffled dashi, among others. I think everyone at our table agreed that Christopher Kostow’s beef tenderloin was a showstopper. I echo my friend Adam: if all beef tasted like this, I wouldn’t mind the frequency with which it appears at the end of tasting menus – often ordinary, often obligatory, and often overkill. But this piece of beef was extraordinarily tender, with a balanced, aged flavor. Despite the generous portion we were served, I don’t think there was a single morsel of it left on any of our plates. Lori Huffman, the pastry chef at George’s at the Cove, ended the evening with two desserts, one of which married plums with cucumbers, a bright bowlful warmed with a hint of black cardamom. Thanks, Villa Vixen, for bringing us all together, and being such a generous hostess! 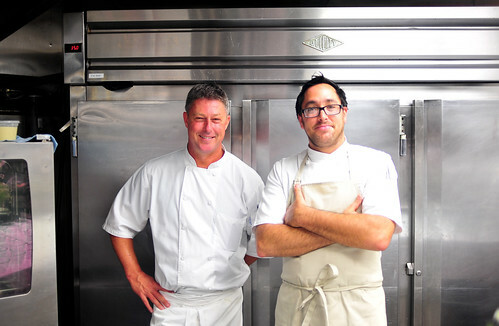 I had invited chef William Bradley to cook at the Harvesters Chefs Classic earlier this year. While he was in Kansas City, I promised him I’d eat at his restaurant on my next visit to his area. So, for my last night in San Diego: dinner at Addison at The Grand Del Mar. There’s too much I want to say about that meal to include it all here. It’ll have to issue under separate cover. For now, I leave you with a list of restaurants where I ate on this trip. I’ve hyperlinked each entry to the photos (or review, if I’ve written one). A big thanks to: Mama Superman; Villa Vixen; Trey Foshee and Madame X; Adam; my cousins Leah, Madi, Sammy, and Chelsea; April Johnson; and William Bradley and his team at Addison, for making this trip such a great one. 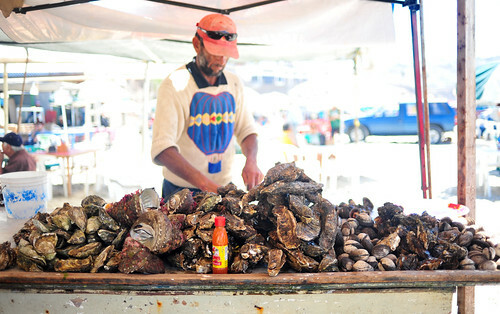 Photos: The beach at Porto Popotla, Baja California, Mexico; beautiful cloches with cheese at Heidi’s, Minneapolis, Minnesota; Trey Foshee and Christopher Kostow at George’s at the Cove, La Jolla, California; ceviche at Mariscos Becerra, Tijuana, Mexico; oyster shucker, Porto Popotla, Mexico; fish and shrimp frying at Tacos Fenix, Ensenada, Mexico; the terrace at Villa del Valle, Valle de Guadalupe, Baja California, Mexico; herbs and produce at Chino Farm’s stand, Rancho Santa Fe, California; Cucina Urbana, San Diego, California; Katianna Weiner, John Hong, and Lori Huffman at the Words Alive dinner, George’s at the Cove, La Jolla, California; sunset at The Grand Del Mar, San Diego, California. ~ by ulterior epicure on September 17, 2012. Thanks for my thanks! Good to see you again!! Awesome to read your report of so many familiar places (even people) Yakitori Yakyudori is where I first fell in love with beef tongue, and I’m now hoping that I will get to try Chef Foshee’s dish during my long overdue visit to TBL3. The warm cheese biscuits w/ honey butter are worth the visit to Urban Solace alone, but the rest of the menu is awesome as well. @April: It was good to see you too. I hope it’s not too long before I’m in San Diego again.